The Miami Dolphins Brass of Mike Tannenbaum, and Dennis Hickey go for the throat in an aggressive break of the final straw while swinging a black cat by the tail, and walking under ladders on Friday The Thirteenth. Trade winds of an absolutely wild Friday the Thirteenth blew Northward from Miami through New Orleans and into Minnesota. It was like watching the bottom line ticker of the stock market report as something changed on a minute by minute basis throughout the league, but especially for the Miami Dolphins. At one moment (due to the Wednesday acquisition of the elite defensive tackle Ndamukong Suh). The often injured, under achieving, overpaid (via Jeff Ireland) linebacker Dannell Ellerbe was suddenly willing to talk about restructuring his near nine million dollar 2015 contract. 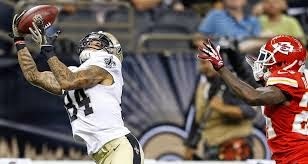 A few scrolls of the bottom line later Ellerbe had been traded to the New Orleans Saints for 22 year old Kenny Stills who is an up and coming speedster receiver with 91 receptions, 1,572 yards for 8 touchdowns over his first two NFL years in a crowded Saints receiver group. Stills is someone that many Dolphins fans were hoping to land in the 2013 draft as a security blanket for the instance of something potentially happening to Wallace. Within an hour of the Kenny Stills acquisition the news flashing red lights appeared across the NFL Network telecast, and the Dolphins had sent the said to be discontent receiver Mike Wallace (29), and the most part of his (Jeff Ireland contracted 12.1 million dollar cap hit) to the Minnesota Vikings. Miami gained a fifth round pick for the eventually to be cut (for nothing gained) Mike Wallace. "Eventually to be cut" due to the replacement of his proficiency Kenny Stills being reeled in moments earlier. As suggested in the Shouts pre free agency receiver roundup. If Miami were to display some aggression in free agency toward replacing the skill sets of a Mike Wallace type, they would then be able to justify (to some extent) the trading and/or eventual cutting of his severely high priced, somewhat distracting attitude. The Dolphins were more than aggressive in landing the same sized with similar speed and skills Kenny Stills to replace Mike Wallace. They did it via the trade route rather than simply going after what happened to be on the open market. The Dolphins gave up a soon to be cut cap casualty Dannell Ellerbe, and a third round draft pick on Stills that they would have likely spent on a speedy receiver anyway, if not for the Stills acquisition. Such a commitment is highly suggestive that Miami is extremely high on the youthful Stills who accrued 64 more yards (931) on four fewer catches (63) than Wallace for the 2014 NFL campaign. Kenny Stills had a 76 yard 2013 touchdown and a 69 yard 2014 touchdown. Mike Wallace had the same number of touchdowns as Kenny Stills in 2013, and seven more in 2014. But wait. A few moments before or after all the above,(who knows anymore with all these sirens screaming, lights flashing, and headline breaking NFL New Years instances taking place upon one another). One way or another Miami lands an instant answer to the 10 touchdown production loss of Mike Wallace. 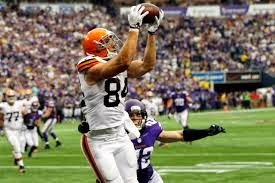 They pick up a 26 year old Pro Bowl free agent Tight End named Jordan Cameron who is a 6 - 5 big play making type of tight end. The Dolphins are hoping to team him up with Charles Clay (whom they still have first rights to), and Dion Sims in order to establish one of the leagues daunting top tight end trio's. In 2013 Cameron gathered in 80 catches for 917 yards with 7 touchdowns from the tight end position for the quarterback deprived Cleveland Browns. Supposedly, 7.5 or so million per season dead President paperbacks that Miami was scheduled to pay Ellerbe for services rendered (or not rendered) will now go in the direction of Miami's tallest skill player in tight end Jordan Cameron over the next two years. Kenny Stills' 2015 New Orleans Saints contract (acquired by Miami) pays him $633,613 single dollar bills for 2015 with 90,000 more greenbacks contracted toward a 2016 cost of living raise. Due to an outright refusal to restructure for the sake of his team without losing money overall. The similarly skilled, temper tantrum throwing Mike Wallace contract would have resulted in an annual 12 plus million dollar Dolphin cap disaster for the next three years. By trading Wallace the Dolphins cleared up approximately 6 to 9 million dollars (depending on structure), and that is after paying Stills. In comparison to their scheduled 2016 contracts Miami will pay at least 12 million fewer ducats to Stills than they would have to Wallace for what is basically the same player with far more youth and maturity. If one were to look at all that took place as one gigantic transaction between three teams and free agency, rather than grade them as three individual transactions? The summarized equivalent goes like this. If you're willing to look at it all with your head cocked slightly to the side! Miami traded the no longer required skills, production, and huge contracts of Danell Ellerbe, Mike Wallace, a third round pick, and inconsequential 7th round pick. The Dolphins gained the immediate replacement to Wallace in Stills, a 6 - 5 Pro Bowl play making tight end with Jordan Cameron (potentially for more reasons than one depending on Clay's final status), and a fifth round pick. Two youthful starting receivers of the ball for one malcontent receiver. Break it down even further and basically Miami gets receiver Kenny Stills for Ellerbe, and a highly productive Jordan Cameron for Wallace (which is more than fair from the Dolphins side of things while saving a guesstimated 6 to 9 million dollars to boot toward 2015. Miami loses a little in the gaining of a fifth round pick for the rights to a third and seventh round pick, but the millions saved, migraines relived, and needs being immediately filled trump those disadvantages of summarized versions. Ndamukong Suh accounts for just six million toward the 2015 cap, the dollars saved in these trades of the no longer desirable Ellerbe and Wallace will be well spent toward KONG in 2016 and beyond! Above all the good that took place. The most inspirational thing about all of this, is that The Miami Dolphins did what they had to do before it had to be done, and/or before it was too late! They made sure that they had all the desirable ingredients in place before pouring their imported cups of coffee, and drank it up at the perfect temperature! And that's just the half of it! Miami also re-signed several of their somewhat productive 2014 players of depth (especially on defense at safety and linebacker), AND they picked up a couple free agent corner-backs. One being a six year veteran Brice McCain who was a 2014 starter for Pittsburgh with three interceptions in nine games that will be tough for Jamar Taylor, and Will Davis/others to beat out for the spot opposite of Brent Grimes and/or the slot position. McCain is similar in stature to Grimes, and is one of the leagues fastest players. Look for Miami to acquire their Big, Tall, Do-It-All True Number One Receiver to be drafted with the 14th pick of the first round.